On the business of “I can see Russia from my backyard,” what you did say to Charlie Gibson was that there were places in Alaska where one could see Russia. Do you still feel that Alaska’s proximity to Russia from whatever place you can see it, is significant foreign policy experience? As Gibson and Palin discussed the conflict between Russia and Georgia, Gibson had asked last year, "What insight into Russian actions particularly in the last couple of weeks, does the proximity of this state give you?" Palin responded: "They're our next door neighbors. And you can actually see Russia from land here in Alaska." The clip on Tuesday which showed Walters bringing up this issue could have been more direct in stating clearly to viewers that the real Palin never stated that “I can see Russia from my house,” or as Walters misquoted the SNL line, “I can see Russia from my backyard.” There is evidence that many voters attribute the SNL line to the real Palin, so it would have been appropriate for the former 20/20 anchor to have said something along the lines of, “Because of the infamous SNL skit, there is a misconception that you once claimed that you had foreign policy experience because could see Russia from your house." Conservative filmmaker John Ziegler has previously demonstrated that some voters mistakenly believe that Palin actually said the words from the Saturday Night Live skit, as shown by his interviews with some Obama voters last year. 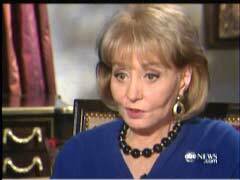 BARBARA WALTERS: On the business of “I can see Russia from my backyard,” what you did say to Charlie Gibson was that there were places in Alaska where one could see Russia. Do you still feel that Alaska’s proximity to Russia from whatever place you can see it, is significant foreign policy experience? SARAH PALIN: Very significant, and we are a gatekeeper for the continent, so far national security reasons, and for energy independence and resource development reasons, Alaska should be recognized for strategic location on the globe. CHARLES GIBSON: Let me ask you about specific national security situations. Let's start, because we are near Russia. Let's start with Russia and Georgia. The administration has said, we've got to maintain the territorial integrity of Georgia. Do you believe the United States should try to restore Georgian sovereignty over South Ossetia and Abkhazia? PALIN: I do believe unprovoked. And we have got to keep our eyes on Russia. Under the leadership there. GIBSON: What insight into Russian actions particularly in the last couple of weeks, does the proximity of this state give you? GIBSON: You in favor of putting Georgia and Ukraine into NATO? PALIN: Ukraine, definitely, yes. Yes, and Georgia. Putin thinks otherwise. Obviously he thinks otherwise. PALIN: Perhaps so. I mean that is the agreement. When you are a NATO ally, is, if another country is attacked, you are going to be expected to be called upon and help.